Toil and Trouble we’re seeing #BookFace double! Fire burn, and cauldron bubble, we saved the creepiest cover for our Halloween BookFaceFriday! “The Book of Lies” by Teri Terry (Clarion Books, 2017) practically jumped off the shelves as this week’s choice. Suspense, menace, mystery, witchcraft, family secrets, and mistaken identity, are interwoven in this page-turner that will grab and thrill teen readers. 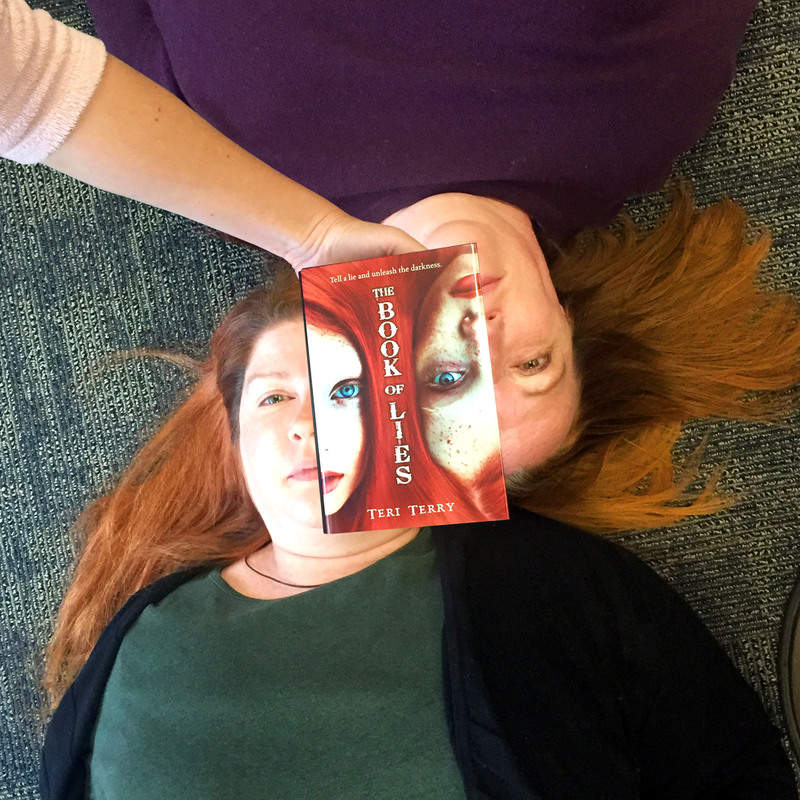 We recruited our office red heads for this week’s spooky #BookFace, Christa Porter, our Library Development Director and Lisa Kelly, NLC’s Information Services Director! 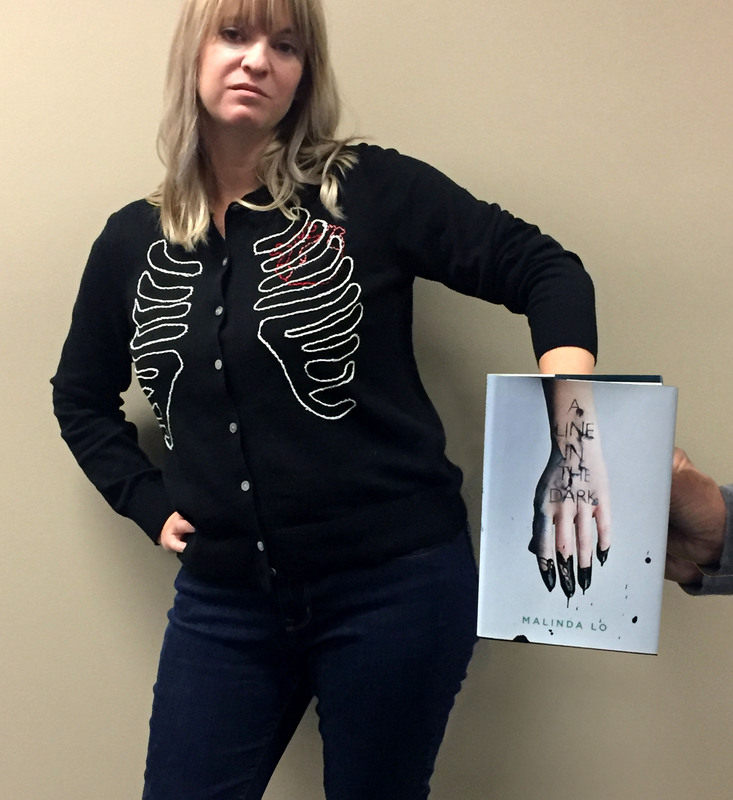 Eat your heart out with this week’s #BookFaceFriday! With Halloween right around the corner we just loved the cover of this teen thriller! “A Line In the Dark” by Malinda Lo (Dutton Books for Young Readers, 2017) is the perfect choice to get your blood pumping. Love, loyalty and murder make this dark physiological thriller one you just can’t put down. This title comes from our large collection of children’s and young adult books sent to us as review copies from book publishers. When our Children and Young Adult Library Services Coordinator, Sally Snyder, is done with them, the review copies are available for the Library System Directors to distribute to school and public libraries in their systems. This week’s #BookFace model is one mother you don’t want to mess with. She’s also our Information Services Librarian, Aimee Scoville Owen! Happy #BookFaceFriday from the Nebraska Library Commission! Did you know we offer YA titles in our Book Club Kits? Don’t miss out on Scott Westerfeld’s teen novel “Uglies” (Simon Pulse, 2011)! “Uglies” is the first novel in a three-part series that has more than 3 million books in print, has been translated into twenty-seven languages, and spent more than fifty weeks on the New York Times bestseller list. You’ve seen this week’s #BookFace model before, you just might not know it. Information Services Librarian, Aimee Owen, is also our weekly hand model holding up all the books we feature. 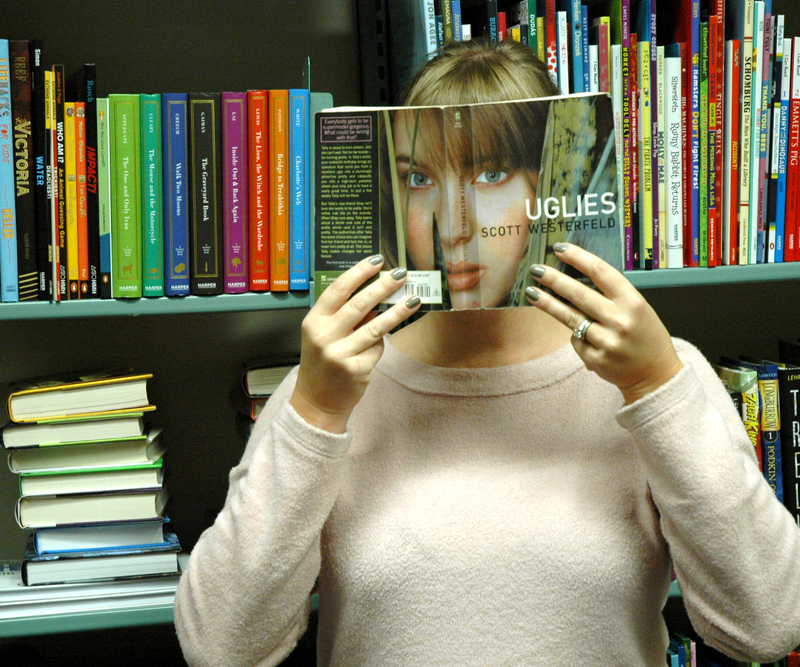 Check out our past #BookFace photos on the Nebraska Library Commission’s Facebook page!